Celebrating birthdays is something I enjoy, especially when it’s my own. But since my mother, Joyce, is enjoying one of those milestone birthdays–the big “70,” I planned a vacation worthy of her extraordinary life, which means no backpacks or Howard Johnsons (see Datong, China). We departed Chicago via Newark on United Airlines on Wednesday, August 26 and, since she is technically injured and scheduled for hip surgery October 27, we traveled in style: first class. 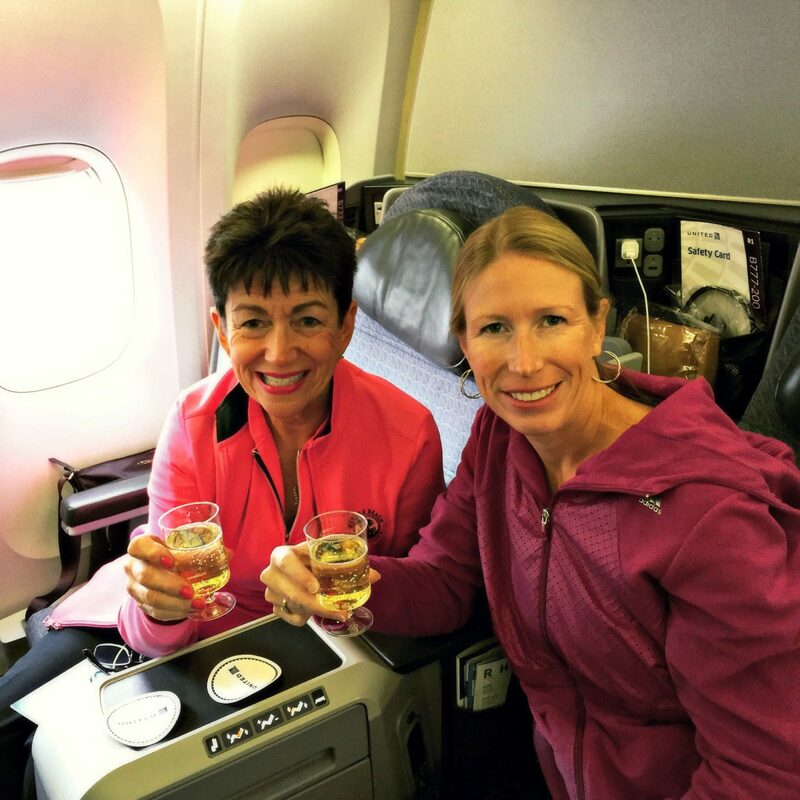 Unfortunately, we flew a U.S. carrier where first class is anything but posh. Thankfully, the front of the plane includes real silverware and bottomless wine–at least until the lights go off for sleeping. A reclining “bed” beats back of the plane–where I tend to travel–any day of the week. After a mere 7 hours, with our crew readying the plane for the descent, I, too, prepared myself for arrival, and discovered, to my chagrin, that my passport was missing. Frantically, I emptied the contents of my bag, dug my hands into seat pockets and then tore apart seat cushions. (I hope you never have to look under an airplane seat, where I found food for a family of four.) And when I lifted my head from the floor, there stood Joyce who discovered she’d collected my passport with her own when we first boarded. Instead of admitting guilt, she blamed me for not putting it away in the first place… Only 9 more days to go. We arrived in Milan and became thoroughly acquainted with about 300 Chinese students in the immigration line. Our fellow passengers whisked by us in the adjacent line as we stood, exhausted and sweaty. I always pick the jackass line no matter the country. About 50 minutes later, Joyce and I stepped forward to the customs officer, who examined our faces, noted we were American, smiled and said, “So good to see an American passport.” I responded, “we are glad to see you, too,” and, without a single question, he stamped our passports and our journey in Italy began. 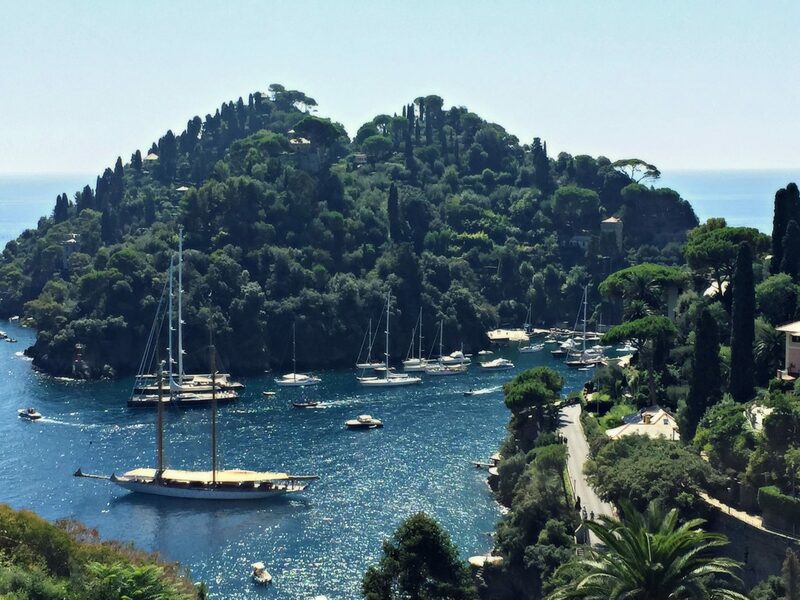 Two hours later by car, we found ourselves in the seaside village of Portofino on the Italian Riviera at the Hotel Splendido, a sliver of paradise on the Mediterranean Sea. Portofino is known for its colorful homes and buildings and its quaint harbor. 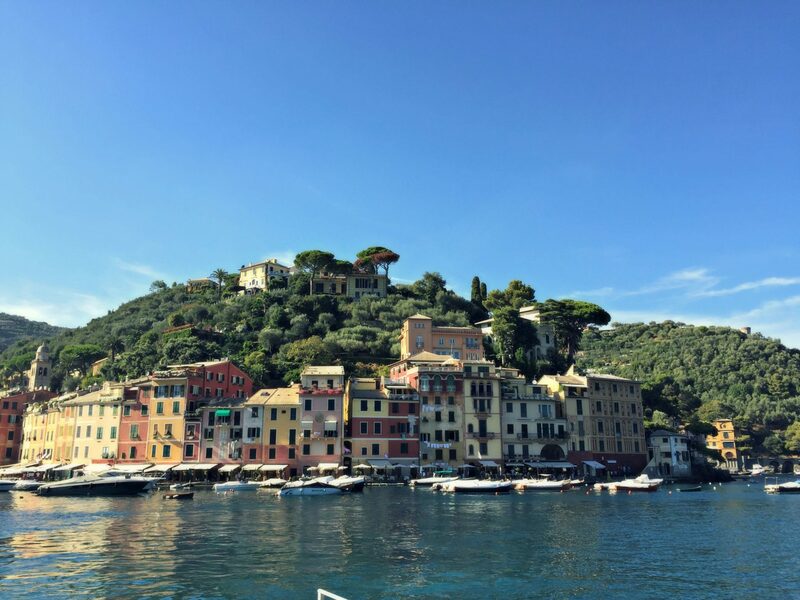 Celebrities and the wealthy put Portofino on the map in the 60s as they traveled from Rome, looking for serenity. It’s considered a getaway for artists, models, dreamers and romantics… and newly discovered by daughters. The marina area is dotted with al fresco restaurants offering pizza, gelato, fresh seafood and high end Made in Italy shopping with the likes of Salvatore Ferragamo, Brunello Cucinelli, Louis V, Pucci, Missoni etc. Crowds converge along the water’s shore at all hours of the day, but for great people watching, take a seat for a cocktail or meal around sunset and entertain yourself with locals and tourists mingling. We dined at the Chuflay, Splendido Mare (our hotel’s sister restaurant) for our first proper Italian meal: dorado, pesto pasta and fresh eggplant. A piano player provided a certain peaceful ambiance, making it a perfect evening. Determined to sleep through my mom’s snoring, a condition she vehemently denies, I purchased three types of Mack’s earplugs. Ladies and gentleman, we have a winner! The Mack’s wax plugs worked so nicely that we slept 11 hours on our first night in Italy. Ooops. What we needed after a proper rest was more relaxation poolside at the Splendido. We lounged with umbrellas and Pellegrino, watching the likes of the Balista and the Polaris yachts depart our little village for the great open sea. It gives new meaning to the phrase “living the life of luxury.” My mom suggested I should gather (look desperate) at the hotel bar or mingle near the multi-million dollar yachts. 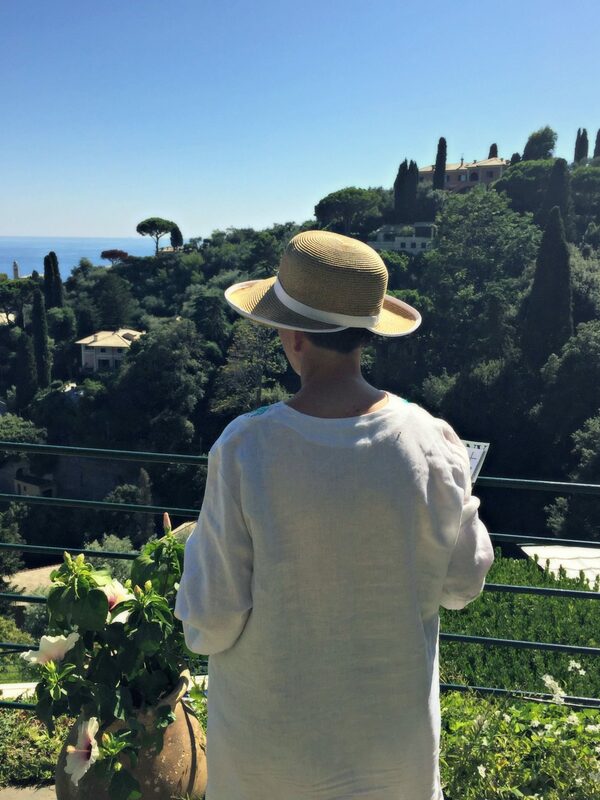 She is always trying to marry me off and reminded me again,”it takes as much effort to find a rich man as a poor man.” After 24 hours of hanging in Portofino, she has me convinced she can’t be wrong.